For those already or interested in using Datadog, detailed Aiven service metrics can easily be sent to Datadog with just a few clicks. We've put together a quick guide to get you started. But first, what exactly is Datadog? Datadog is a popular cloud-based monitoring service that allows various metrics to be sent to it via special metrics collection agent software installed on servers. It provides easy-to-use graphing functionality as well as the ability to arrange multiple graphs into service dashboards, alerting, logging functionality and so on. 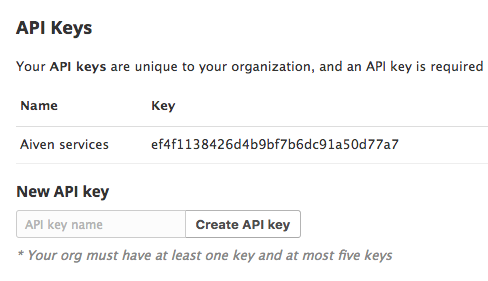 If you have any, you can pick an existing API key, but for this example we will create a new Aiven-specific API key. Next, go to your Aiven account, make sure the correct Aiven project is active, and choose Service Integrations from the left menu bar. Click the Add your Datadog API key button and we're almost done. Now, we'll activate Datadog metrics for the Aiven services of your choice. 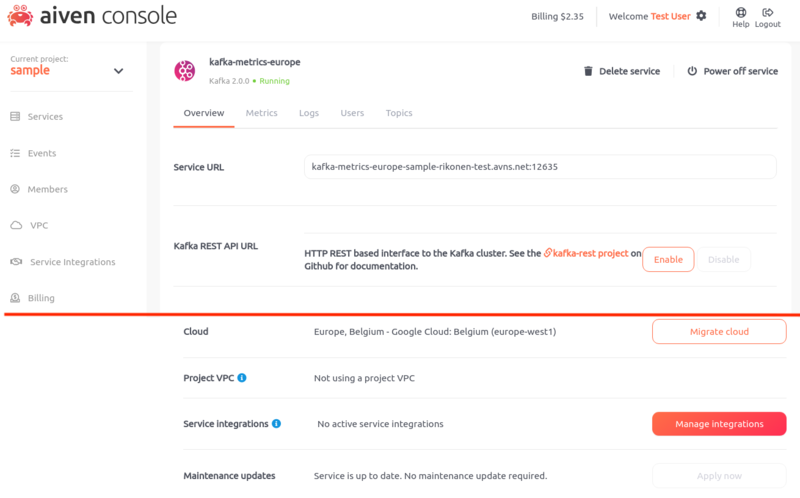 NOTE: If there is a maintenance update available named "Datadog metrics support" available for your service, it will need to be applied before Datadog can be enabled for the service. 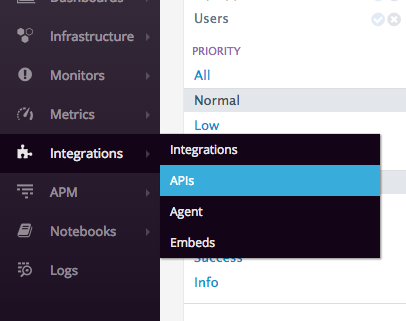 Lastly, click the Enable button to turn on Datadog metrics for this service and that's it! Note: it may take a minute or two for Datadog to start displaying the metrics for the service. On Datadog dashboard editor, add a new widget (or edit existing one). Select a metric (for example, for Kafka service jvm.heap_memory ), and Datadog will autocomplete various tags to from field. You can select multiple filters; for example, aiven-service-type:kafka and aiven-project:prod . After configuring the graph, click Done, and remember to save the dashboard as well. Which tags are available on Datadog? We add a variety of tags to metrics, including aiven-service-type: , aiven-service-name: and aiven-project: . You can use these tags to filter services shown in your dashboards. Which Aiven services support this? 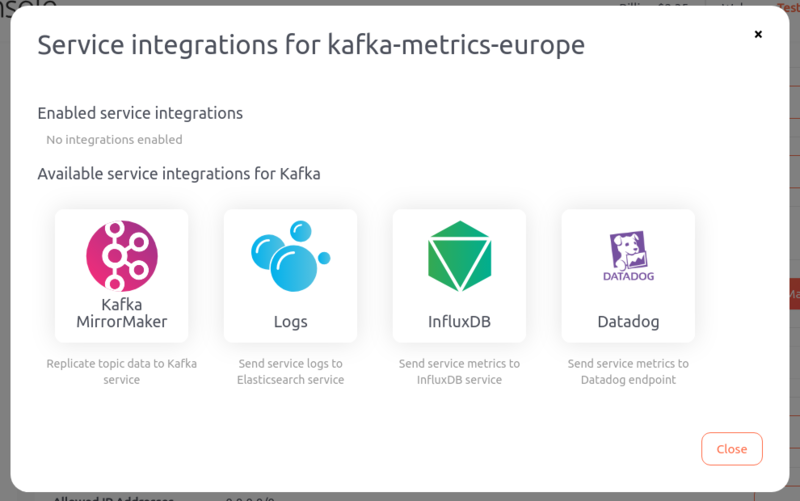 Currently we support Kafka, Elasticsearch, PostgreSQL and Redis. Does this affect my billing? Using the Datadog integration does not affect Aiven billing. Do note though that Datadog will still charge for the integration's metrics based on their regular pricing. The costs incurred from Datadog are solely your responsibility as the Datadog account owner. Datadog logging is not currently supported. How does this differ from the Aiven InfluxDB and Grafana-based metrics integration? The Aiven metrics service integration utilizes Aiven InfluxDB and Aiven Grafana services to provide similar graphing and dashboard functionality. The Aiven metrics integration is built on Open Source components. Utilizing an InfluxDB service to store the metrics data allows full access to the data stored in the database via InfluxDB queries and virtually unlimited retention for the data. Grafana-based graphing and dashboards allow for tapping into Grafana's advanced features, such as extensive plugin support, a best-in-class graph query editor, alerting, and superb visualization.